SkyTruth is helping make the world’s oceans a little less mysterious and a great deal more transparent with the public beta release of Global Fishing Watch, announced today at the Our Ocean Conference in Washington, DC. 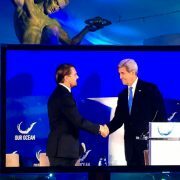 Actor and ocean advocate Leonardo DiCaprio announced in his remarks to the conference that Global Fishing Watch is now free and open to the public, and U.S. Secretary of State John Kerry personally received a demonstration of the tool from the Oceana, SkyTruth, and Google team. In partnership with Oceana and Google, Global Fishing Watch was designed, developed, and tested by SkyTruth to enable users to map and analyze all of the world’s trackable commercial fishing activity. Global Fishing Watch is the world’s first dynamic, global, near real-time measure of fishing activity. SkyTruth is proud to make this tool available to the public, enabling researchers, advocates, regulators, consumers, and industry to shine a light on fishing activity and pierce the fog of uncertainty surrounding global seafood supply chains. Above: With Global Fishing Watch, users will easily be able to visualize when and where fishing activity occurs. This visualization depicts six months of fishing activity by three of the world’s most prolific fleets – fishing vessels flagged to China, Japan, and Spain. Our oceans are under pressure from overfishing, and recent stories about crime on the high seas have riveted the public’s attention. Global Fishing Watch gives legal operators a way to show the world they’re playing by the rules and that they deserve access to premium seafood markets. Global Fishing Watch provides regulators with an easy way to visualize their own data, and GFW will empower citizens and indigenous peoples to hold regulators accountable for enforcing the rules. Oceana, SkyTruth, and Google unveiled the prototype in November 2014 at the IUCN World Parks Congress in Sydney, Australia. Today, Global Fishing Watch unlocks the power of machine-learning, mapping, and a near real-time feed of satellite data to anyone with a modern computer and decent internet connection.